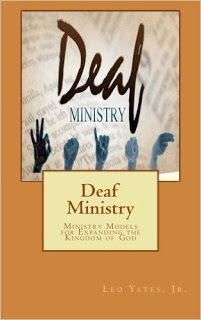 Leo Yates Jr has put together a book that is a comprehensive guide to ministry with Deaf populations. It also contains information for ministry in groups that fall under the hard-of-hearing umbrella. And while we’re at it, the principles in this book apply to ministry with any group of people who live with disabilities. To start at the beginning, we learn the difference of Deaf and deaf, and the history of these groups in relation to the church, always with an eye toward inclusion at all levels and with all kind of differences. Here is also an example of how this book can apply to a variety of disabilities. There’s an excellent section on the nature of Deaf cultures—an inclination toward a visually-oriented culture, and how this differs from what we’ll call “mainstream” culture as a term of reference. Having worked through this, there is then a section on “audism,” which is a mainstream judgment of the Deaf-visual culture. This line of thought brings out many parallels to disability studies principles, and helps extend them to a wider use. The cultures of physical disability often focus to a great extent on structural layout of facilities (ramps, for example) in a way that many people do not understand. But when we understand visual culture or ramp culture, our perception is expanded and we begin to think in new ways. These new ways of thought critique both audism and ableism (the term used to refer to mainstream judgment of physical disability culture) so that those within the group understand better what has been happening to them, and those on the outside understand better what “the other” is dealing with. Perhaps allies are gained, or understanding furthered, toward the goal of inclusion as this process works out. There are, of course, many differences and problems. For one, Deaf culture is largely invisible, placing it in an often-misunderstood and often-challenged group. Those who live with invisible disabilities are often challenged by others as “not disabled”—especially when they park (even with appropriate credentials) in those spaces near the front of a lot that are reserved with the wheelchair symbol. For better or for worse, that wheelchair figure is a symbol for anyone who needs an accommodation, whatever device (or none) may be required. But a bigger problem is that to be out of sight is to be out of mind. Several times I have asked at places of worship or public assembly about assistive sound systems or the lack of ASL interpretation. The answer is generally along the lines of “I never thought about that.” It’s remarkably similar in process to the “no one who uses a wheelchair has ever been here” defense that I receive when asking about ramps. Raising visibility is necessary, but it’s difficult when we lack role models, or when some focus on medical cures rather than an abundant life. An important point along the way through this book include the nature of using a minority language. In such a culture, storytelling takes on increased importance. Today, many don’t think of the power of stories to bring us together and form groups, but Deaf communities still bind together in this manner. As they do, it is important to understand the ethics of these groups. For one example, an interpreter is not a judge, nor is she a translator. Confidentiality is expected when interpreting, and so is clear expression. Sloppy speakers should not expect an interpreter to clarify for them! These kind of details are examples of the thoroughness of the book’s coverage. As the author notes, in reaching out to others, we must be sensitive to the receiving culture. Far too often, mission has been an exercise in extending authority and conformity, not in expanding the reach of divine justice, whose expectations and implementation were so confounding to the audience of the Gospels, as well as today. Where does that leave us? The book concludes with answers to what seems to be the most-asked question in our e-mail: how do we get started? We all know about prayer, teams, and so on, but are reminded to start small and build well. A solid foundation built on rock will last! Beyond that, we are reminded that a ministry with requires inclusion on all sides, an inclusiveness which requires education as well as change. With that very Wesleyan observation, Yates reminds us that the goal of all this is more than inclusion, as important as that is. The goal is to bring all of us together into the kingdom of God. Everyone has a place, everyone has a different gift, and we all remain individuals. The kingdom of God does not subsume differences, but celebrates them as examples of God’s creativity and love. As we encourage, welcome, and set examples to follow, we advocate for the day when the true meaning of God’s rule comes, on the earth as in the heavens.